The tide has newly changed. On Thursday, the US stock markets reached their respective daily cycle lows going to bounce up now during two, most likely three week candles (10 to 15 trading days up) until the several time negatively tested strong resistances are worked off resp. reached that result from the alltime high and the monthly time frame. The uptargets of the S&P 500 that are offering themselves resp. can be calculated are: 2083 = minimum uptarget for the coming up cycle, furthermore 2095 and even 2101. 2101 as important uptarget and probable final June 2016 high is downright imposing on us, in my opinion. After being worked off one June target or all of them - 2083, 2095, 2101 -, the recent after FOMC low at 2026 becomes a critical level. If the market wants to close below the 2026 on weekly closing base from 06/01/2016, some enormous downforces can be unleashed and as a result, an 100, 150 pt. panic down-move might emerge. The next really important buy signal in the S&P 500 will be triggered only in case the month of June 2016 closes unequivocally above 2096. Such a June buy signal in the monthly time frame would likewise bring to an end the tenacious shoving sideways of the last couple of months, activating 2500 index points till year end 2016. 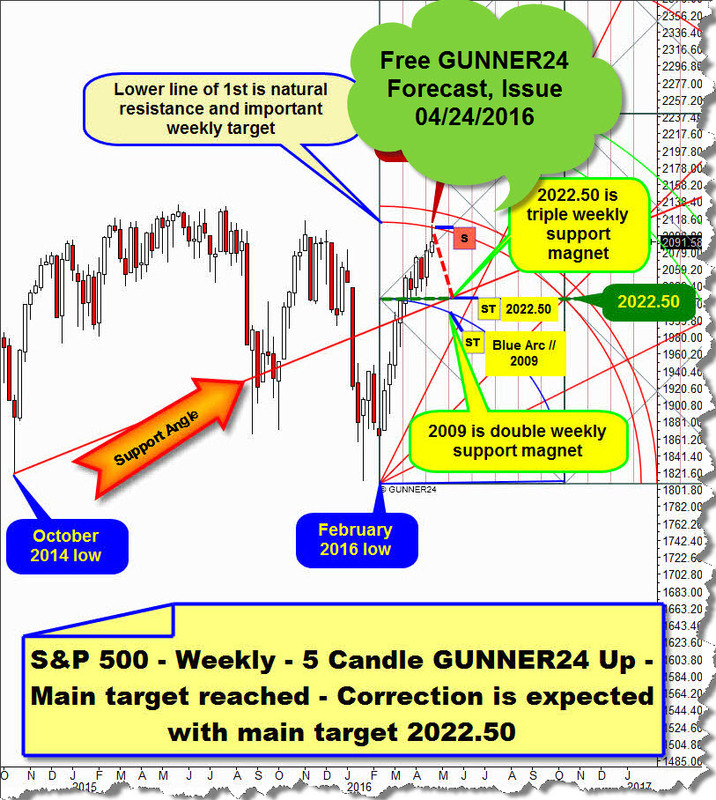 On 04/24/2016, in the free GUNNER24 Newsletter issue we could state that the S&P 500 had to fall and correct cause the April high reached a main uptarget and starting there enormously strong and important Gann Resistances kicked in. ==> A month ago, the index was expected to correct into the area of the multiple = strong 2022.50-GUNNER24 Support Magnet. Inter alia we could derive this important support magnet in the weekly time frame with the help of the 5 Candle up starting at the February 2016 double low we placed in the chart above. The last correction move starts at the April high ending at the weekly double support magnet. Compliantly, both weekly up setups starting at the February 2016 double low are newly signaling that the after-2025.91 FOMC low of Thursday has reached and worked off strong weekly support. This condition permits the development of the next strong upswing in the weekly time frame. Within 5 Candle up, the 2025.91 low touched the first square line support. Within 3 Candle up, the upper line of 1st double arc support was met to the T at the Thursday low. The strong reaction of the index into the positive week close confirms unambiguously the EXISTANCE, IMPORTANCE and POWER of the weekly double support magnet. Cause the correction has met weekly double support magnet after a 5 Fib number period in the weekly time frame, and the correction in the daily time frame comprised exactly 21trading days, an upswing is to be expected. For the Fib number combination of 5 weeks down and 21 trading days down are mostly an unmistakable for an intermediate extreme according time factor to be reached. ==>The market should bounce upwards next for at least 1 week, or much more likely for 2 resp. 3 weeks. B) Backtest of the lower line of the 2nd double arc resistance within 3 Candle up = 2095 within 2, 3 trading weeks. The subsequent weekly up setup - starting price is likewise the February 2016 low – is signaling however a new test of the "round" 2100 threshold for the potential final June 2016 high. The April high was compelled by the currently most important + highest + strongest resistance, the ATH Angle 1 (ATH = alltime high) at the right dark arrow. The subsequent correction fell below the second most important + currently second highest ATH resistance, the ATH Angle 2. With the present candle, the correction ended extremely straight to the point at the Support Angle on Thursday. From there, the market began bouncing upwards. The current week candle marked its week high (2072) exactly at the ATH Angle 2 – now again strong ATH resistance – bouncing upwards from the presently strongest week support, the Support Angle. The ATH Angle 2 is manifold negatively tested ATH Resistance Angle. In the past, it was tested negatively three times at the light-red arrows. By all means, in the course of the now expected bounce it will have to be headed for since it is newly a strong up magnet for the price. 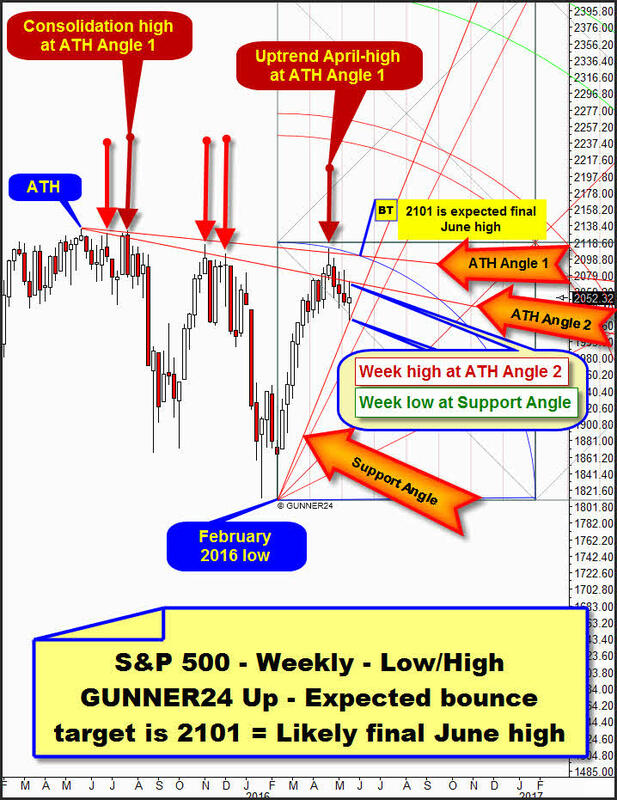 The ATH Angle 2 – for next week it takes its course at 2070 – is likely to be reached within the next 3-5 trading days. Maybe before the final processing of the 2070, the S&P 500 will have to close once more the just razed daily gap at 2040.04 at the beginning of next week in order to march towards the 2070-ATH Angle 2. Hence, at 2070 is ATH main resistance for next week the S&P 500 not being expected to crack it soon. So, after the 2070 being reached, a short-lived consolidation resp. short-lived pullback reaction is supposed to start, being most swiftly taken upwards the ATH Angle 2 after this recess in the bounce. Over coming finally the ATH Angle 2 will automatically activate the new test of the ATH Angle 1. This one intersects the Blue Arc resistance in 3 weeks at exactly 2101 forming there and then the currently strongest resistance magnet for the market. The 2101 being worked off through 15 trading days will be activated in case of one single daily close above 2072 or a weekly close above 2072 next week or the week after next. At 2101, there is the natural ATH Angle 1 resistance and the natural Blue Arc resistance ensuing from the February 2016 low. For the month of June, this magnet forms an incredibly attractive up magnet and an incredibly attractive ATH resistance magnet whose breakthrough in June 2016 will be supposed to release a monster upwards thrust towards 2500. Yet, after reaching the 2100 in June 2016 the S&P 500 is much more likely to rebound again most heftily from there! The possible and expected third test of the ATH Angle 1 in June 2016 – in case it newly results negatively – MAY, just MAY be the trigger for a strong sell-off move!